Whiskey Throttle... why that name you ask? Well, in the Urban Dictionary "The real whiskey throttle is when you give too much throttle and you start to slip off the back of the bike/4 wheeler and your hand just pulls the throttle more and you go out of control!" That's why the guys in my band call it Looped Out Rock & Roll! They are all dirt biking daredevils that love to play good rockin' music! SO... 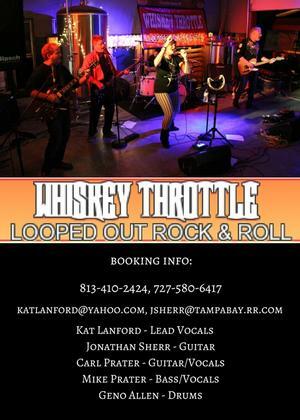 Whiskey Throttle is a 5 piece band that was formed by a group of seasoned musicians. We share a common interest in providing a professional show with a full sound playing everyone's favorite rock and alternative songs. Our focus is on the 90's and newer with some great classics, and a couple country ones sprinkled in. Kat Lanford- Lead Vocals. Kat has been singing pop, rock, country, oldies, dinner music, standards, etc, in the Tampa Bay area for almost 16 years. Initially, she was in "Affiniti", for 8 1/2 years which was a 4 piece rock band. She then began playing in duos for weddings, private parties and different bar/restaurant locations all over Tampa Bay. She was also in another pop/rock 4 piece called "5th Avenue Band." She has been the go to girl when a band or venue needs a polished singer who can perform anything from the National Anthem to Janis Joplin. Her opportunities to sing as a solo, duo, trio, 4 piece and now 5 piece, has made her very well rounded for any entertainment instance. She now also brings her power house vocals to Whiskey Throttle. Jonathan Sherr-Lead Guitar. Jon has extensive experience playing in top notch Tampa Bay bands for 2 decades including being the original lead guitarist in the "Edge of Red Band" and earlier in "44th Street." He's focused and concise on the music he delivers everytime he picks up the guitar. Bruce Hollingsworth - Drums/Singer - Bruce started playing drums at an early age. He was playing country music in the 7th grade in his uncle's band with 2 of his cousins. Then he moved on to rock n roll and played in a lot of local bands in Indiana. In 1987, he relocated to Florida and played in many local bands such as Star Force, Trick Shot, and the Suspects, to name a few. He loves being the back bone of the band and singing. He has played for many great events here in Florida and is looking forward to many more. Carl Prater-Lead Guitar and Vocals- Carl has played many of the topnotch Tampa Bay clubs. He's our sound engineer and is always putting on a great sonic experience! If there's a new technology that makes the sound better than before, he's on it! Mike Prater-Bass and Vocals-Mike, along with his brother Carl has played numerous Tampa Bay shows. Mike is a versatile musician playing bass, guitar and percussion with a great sense of humor and constantly thinks outside the box! Please contact us for your next club event, private party or other event needing a well-polished topnotch band that will play what your crowd wants to hear! We will not disappoint you!